Student assistants from the University Scholars Program, National University of Singapore, scanned this image under the supervision of George P. Landow in 2000. 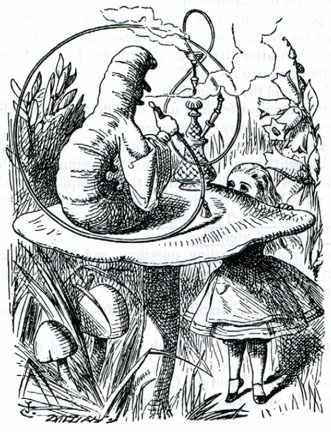 Tenniel's illustration establishes a hierarchical relationship between Alice and the Caterpillar. The insect, pictured in profile facing away from the viewer, grasps the hookah with a human hand that emerges from a wide-sleeved shirt. The coil of his hookah wraps a fully around his body — creating a bordered circular shape that immediately draws the viewer's eye to the figure inside it. The mushroom upon which he sits raises him to the top of the picture-space. Alice, conversely, stands below the Caterpillar on tip-toe. His mushroom impedes the viewer's view of her body, cutting her off from midsection to nose. The eyes are the most noticeable feature in this depiction of Alice; she raises them up, widened in wonder, toward the Caterpillar. The naturalistically drawn plants in the background emphasize Alice's small size: shoots of leaves and foxgloves tower over her, hemming her into the Caterpillar's mushroom. The Caterpillar therefore dominates the visual space of the illustration, almost as if Tenniel envisioned a type of court scene in which the lowly Alice presents herself to the imperious insect.